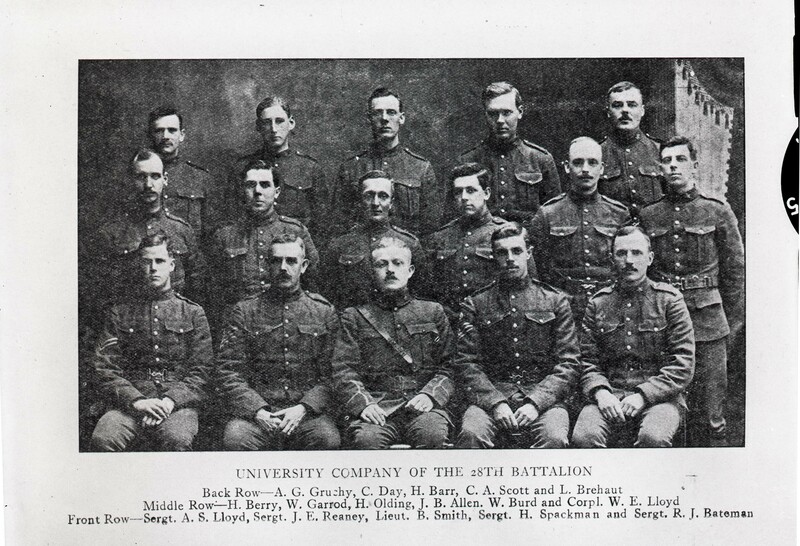 The Great War exacted a heavy human toll on the University of Saskatchewan. Of the 345 students, faculty and staff who enlisted, 69 "passed out of the sight of man by the path of duty and self-sacrifice." About 100 were wounded. 35 were awarded medals of valour. The School of Engineering closed its doors for the 1916-1917 session when the faculty and students enlisted en masse. The last wave of enlistments came in March 1917 with twelve more undergraduates. They were in France by mid-summer. The doors of the University remained open for the duration. Classes were taught, students graduated and the scope of research expanded. Women filled roles formerly the exclusive domain of men. Well before the conflict ended, campus was dealing with the education and reintegration of a wave of returned soldiers. On the heels of victory came Spanish Influenza. - sung on Ladies Night at the “Lit,” 25 February 1916 Miscellaneous collection, file 67. The material in this and other sections is taken fron the University Archives and Special Collections and has been divided into twelve sub-categories.